Lewis Weintraub, MD, a Professor of Medicine at Boston University School of Medicine (BUSM) and a BMC Hematologist/Oncologist and, has been named the 2011 recipient of the Jerome Klein Award for Physician Excellence. 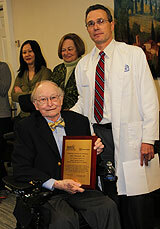 The Jerome Klein Award was established in 2010 to commemorate Dr. Klein’s 50 years of service to BMC/BUSM and is presented annually to a physician who shares Dr. Klein’s attributes. Weintraub, who has served the BMC/BUSM community for 39 years, received the recognition for his clinical and research excellence, leadership and dedicated commitment to education and mentoring. “Lewis has a gentle approach to educating and mentoring his students, and he makes sure patients always receive the ultimate care,” Ravin Davidoff, MD, Chief Medical Officer, told the crowd gathered in the Wilkins Board Room Jan. 31 to celebrate Weintraub’s achievements. During his career, Weintraub pursued a broad range of clinical and translational research topics in hematology. He is the author of 78 papers and reviews, and has served on numerous hospital and school boards. Teaching, however, has been a key interest throughout his career, and an area in which he has made a great impact. Weintraub attended Dartmouth as an undergraduate and then Harvard Medical School. He trained in medicine at the Hospital of the University of Pennsylvania and the University of Michigan and then in hematology at Mount Sinai Hospital. During the Vietnam War era, he joined the “yellow berets” and served as the Assistant Chief of Hematology at Walter Reed Hospital, where he also carried out research on iron metabolism. He returned to Boston in 1965, first on the faculty at Tufts Medical School and New England Medical Center. In 1972 he was recruited to Boston University School of Medicine as an Associate Professor of Medicine. In 1977 he was promoted to Professor and Chief of Hematology at University Hospital (now known as BMC), a position he held until 2003.